To Meghan Markle, which will come as no surprise to anyone. 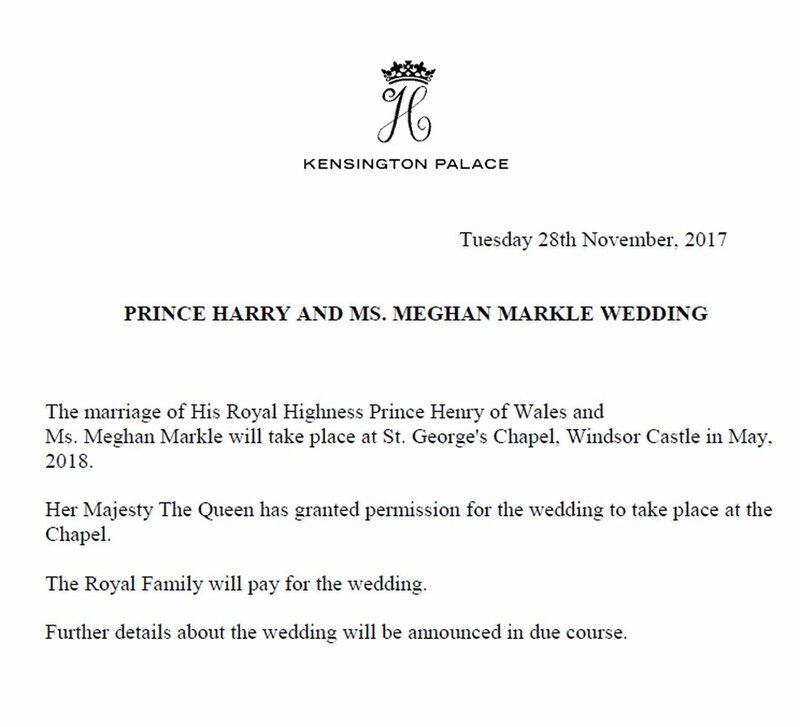 The wedding will be in the Spring, though the exact date is yet to be announced, and will be a church wedding even though she has been married previously and divorced; the rules on this have changed apparently. The venue also is yet to be announced, and probably decided. I am delighted, as I'm sure everyone here will be. With one exception; I wouldn't exactly say I was looking forward to Dom's meltdown, but I do anticipate it with a certain amount of morbid fascination. Title? Earl or Duke? Royal status of children? For the last, I guess we'll have to wait for one to be on the way, and for the title until the wedding day as usual. But I hope the Wessex precedent will be ignored and that the answers will be Duke and royal. And, of course, that the couple will live long and happy lives together. From the tons of stories I have read during the day, it seems that "Duke and Duchess of Sussex" is what most people think they will become. Some stories even say that this is the title that Prince Harry wants. Ms. Markel is a beautiful woman, and I'm sure she's lovely as a person too. I've seen some nasty comments on line today about her bi-racial heritage, about the fact that she's an actress, that she's divorced, and even that she's Roman Catholic (about which I've seen some dispute as her first husband was Jewish, her father is Episcopalian, and her mother's religion is not known for certain by anyone reporting on this story it seems). The blurry images of the ring show it to be quite beautiful. Her coat that she wore for the announcement however was not my favorite. It' looked like a bathrobe if you ask me. A divorced American actress isn't exactly what I would consider an ideal description of a future royal spouse, but Ms Markle seems like a thoroughly pleasant and generally respectable young woman. She's also a fine actress- I remember her role in the sci-fi thriller Fringe years ago. It's a bit of a shame that she intends to retire from acting, to be truthful. 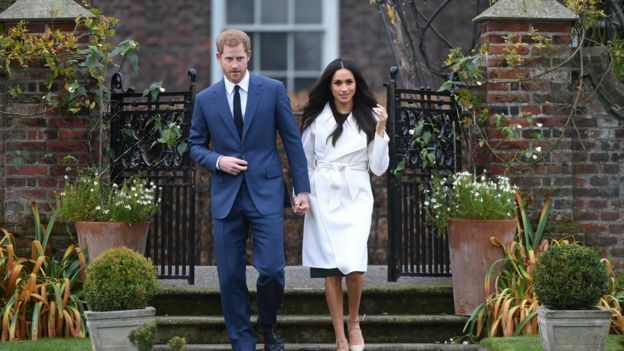 Many of us might pine for the days when royals married within their own rank, but clearly those days are gone and we must get used to commoners regularly marrying into the Firm. It's a little bit harder, though, to stomach a member of the House of Windsor marrying a celebrity. I feel it merely furthers the degradation of royalty to become little more than celebrities themselves, no more special or exalted than any mere actor, sports star or successful comedian. Whatever my reservations, I do like Ms Markle on a personal level, and I sincerely hope that she will adapt well to life as a member of the royal family. It's not an easy thing for an outsider to adapt to and the scrutiny that she will be under will no doubt be intense, so I wish her all the best. I wish the couple well. However my misgivings about the union are along the lines of apparently negating what the whole abdication crisis of 1934-36 was all centered upon. That was another age, and attitudes now are completely different. Nor is Ms Markle anything like such an unappealing prospect as Wallis Warfield. If I had offered a guess as to the title Sussex would have been the likely one, but we may yet get a surprise. In the reports I have read Clarence has been dismissed as unlucky, true, Connaught as extraterritorial, true and I don't think it would even be considered, and Cumberland and Albany as both taken, debatable. Windsor has also been suggested, no chance I would say due to damning associations and also, though this was overlooked the previous time, already taken. Twice. Were I making the choice, I would shamelessly pander to the Scots with Duke of Ross, available and with royal associations. Plus Earl of Kendal, ditto to both. And Baron of somewhere no one has ever heard of in Wales to complete the set (Northern Ireland had its turn at the baronial title last time). About children, I had forgotten that technically only the first-born son would have royal status anyway, extended to other children upon their grandfather's accession. But that could be accelerated at the Queen's wish, as it was for all Cambridge children. There has been a lot of talk in the reports I have seen about Ms Markle's mixed racial heritage, none of it in any way offensive I am happy to say, not that one would expect any such thing. Much of it has been concerned with previous black blood in the royal family, with speculation about the racial heritage of both George III's consort Charlotte of Mecklenburg-Strelitz and Edward III's Queen Philippa of Hainaut. For the African ancestry of the second there is no evidence whatsoever, and for the first about as much; one ancestor so many generations back as to be profoundly unlikely to in any way influence Queen Charlotte's genome, who may conceivably have been of mixed race but there is really np great reason to think so. So typical of the media. They focus on unprovable speculation while ignoring (because ignorant of, not having bothered to do any research) proven fact; DNA evidence demonstrates without doubt that the Duke of Cambridge and Prince Harry have a trace of South Asian ancestry through their mother. In fact their direct uterine line goes back to the Indian subcontinent. Finding that out might have taken as much as twenty minutes' work, which for a journalist would obviously be far too much. For my part I can see no reason why links with the Commonwealth could not be strengthened as well. Duke of Sussex fine, but other subsidiary titles would do quite nicely. Such a shame that Yarralumla, in the Australian Capital Territory, has already been allocated to the Viscounts Slim. Thanks for all of the above informative posts concerning Prince Harry's engagement to Meghan Markle. I believe that in his post above, Peter is referring to William and Harry's maternal great great great great great grandmother Eliza Kewark, who was a native of India, and who married her Scottish employer. (The ancestry is traceable on Genealogics.) However, on some other websites, it's stated that Eliza , though a native of India, actually came from an ethnic Armenian family who'd been long resident in India. Although the DNA tests on relatives of Princess Diana did apparently show some South Asian genetic descent. Just guessing, but maybe Eliza was of mixed Armenian and Indian ancestry. Meghan Markle has an interesting ancestry. According to Wikipedia, one branch of her paternal family traces back to King John. She and Harry apparently share a common ancestry through Richard and Elizabeth Bowes, who lived in the 1500s, which is distant enough that a papal dispensation for being within the forbidden degrees of kindred won't be required. Her British Isles ancestors were of quite mixed heritage, though. According to information posted on the nobiliana.de website, her great great great grandmother was Mary Bird, an Irishwoman who worked as a maid in Windsor Castle in 1856. Mary married Thomas Bird, an English soldier. After Thomas' death, Mary emigrated to America with her 3 daughters. The Nobiliana.de website contains quite a good genealogical background concerning Meghan's ancestors, both paternal and maternal. The maternal ancestors apparently trace all the way back to African-American slaves in 1800s Georgia. I like the Sussex title, but it does sound very English. Because of the present situation, I think it would be a nice gesture toward Scotland if Harry were to take a Scottish ducal title. Duke of Ross is a nice, historic royal Scottish title. But for the rank-and-file populace nowadays it might have somewhat of a local connotation to the WestHighland district of Scotland. I think that a title that would resonate through all of Scotland might be even more worthwhile in these unsettled times in which we live. It would have to combine ancient tradition with modern innovation. Something like 'Duke of Alba' might work. (The old Scottish Alba, rather than the Spanish one). It has the same derivation as Albany, yet has its own uniqueness. It is a little contrived, but it's very, very Scottish, references the whole region, and might appeal to the Scots. 'Duke of Caledonia' is another possibility. On the other hand, perhaps they sound too over-reaching or fatuous. A new ducal title based upon Australia would actually be a nice gesture also, but it might be a little too presumptuous given the present times that we live in, especially since Harry likely won't be resident in Australia. Anyway, we'll just have to wait and see what happens. Likely the Queen, the Prince of Wales, the Duke of Cambridge, and especially Harry himself, will be able to come up with something appropriate. Yes, that's correct, Windemere. Very little is known about the lady; although she was spoken of as Armenian she was also described as just a 'native'. I don't believe there's a record that she ever married her employer, who was also the father of her daughter from whom the princes descend, but no matter. The mitochondrial DNA sub-group possessed by relatives in the same maternal line is very rare and found mainly in Nepal, so clearly whether Armenian or not this lady did have some subcontinental ancestry. As can be seen above, we now know the location and the month planned for the wedding, both of which seem appropriate choices. Alba, a name for the original Scottish kingdom, is the root of Albany, a traditional title for the second sons of Kings of Scotland, in much the same way as York became in England. Either Albany is available or it is not, and if 'not' is the decision then I would think Alba is too close to it. The above was from memory, and I have now bestirred myself to check the source (which, despite my disparaging remarks above, was a newspaper article). My memory was not perfect; while the mtDNA is from a very rare sub-group most of the few examples have been found in India rather than Nepal. The article does say that the lady married her employer, but I am skeptical as that would actually have been considered far more scandalous than his taking her as a mistress, a perfectly normal and regular arrangement, as chronicled in Kipling's beautiful Without Benefit of Clergy. To further correct myself, as things stand none of the couple's children would have royal status until their grandfather's accession; formerly the eldest son of the eldest son of the Prince of Wales would have done so, now extended to all children of the eldest son of the Prince of Wales. But Prince Harry is of course not the eldest son, so unless the Queen decides otherwise any children will initially be just Lord or Lady so-and-so Windsor, or possibly Mountbatten-Windsor. In the reports I have read Clarence has been dismissed as unlucky, true, Connaught as extraterritorial, true and I don't think it would even be considered, and Cumberland and Albany as both taken, debatable. It shall be lawful for the successor of any peer whose name has been so removed, to present a petition to His Majesty praying to have the peerage restored and his name placed on the Peerage Roll ; and His Majesty may refer such petition to a committee of the Privy Council constituted as aforesaid ; and should the committee be satisfied that such person has incurred no disability under this Act, and is well affected to His Majesty's Person and Government, His Majesty may thereupon direct that the peerage be restored and the name of the petitioner be placed on the Peerage Roll ; whereupon all rights and privileges of the holder of the peerage shall revive and be in force as if the name of the peer had never been removed from the Roll. It would create a bit of a problem if Harry was given one of these titles, and then a future heir should petition for its restoration. Whilst I have no idea what the situation is in Australia and New Zealand, the Nickle Resolution in Canada would, in no way, prohibit the use of a Canadian subsidiary title. Even tho' it is not law, and was rescinded not long after adoption, it is treated as stare decisis. However, it applies only to Canadian citizens, which Harry is not. This is why, whilst HRH the Duke of Edinburgh was sworn as a Privy Councillor of the Queen's Privy Council for Canada in 1957, it took until 2013 for him to become an Extraordinary Commander of the Order of Military Merit and an Extraordinary Companion of the Order of Canada, the 'extraordinary' indicating that he is not a Canadian citizen. He had refused to accept the honours for years because of that, but the crusty old sea dog has mellowed somewhat with age. I for one share in the joy of this engagement. However, we're seeing the typical race-baiters at Newsweek and Buzzfeed looking for "racism" under the bed and trying to stir up trouble. You see, it doesn't matter now that Prince Harry is engaged to Meghan Markle. It won't change the opinions of those who see Britain and the monarchy as "racist" and "white supremacist" and no niceness on part of our Royal Family is going to win over our enemies. The thing that does concern me is that just as the Diana cult has been used by some to attack the monarchy and monarchist, the identity politics freaks may well do the same with Harry and Meaghan. Their goal is to divide and destroy. Monarchists must not fall for their bait. Replying to Jovan re the Albany and Cumberland titles, I was of course aware of the problems. On the Albany title specifically, firstly it would be a great shame if such an old and historic title fell into permanent desuetude because the possible heirs cannot be bothered to lay claim to it. Secondly it appears profoundly unlikely that they ever will. And thirdly it seems at least questionable whether they can, as marriages of successive heirs have not been authorized under the Royal Marriages Act 1772, arguably rendering them invalid in British law and children of the marriages technically illegitimate. That Act has now been repealed and there was a retrospective element to the repeal, allowing those genuinely unaware that they required consents to have their marriages validated, though not for purposes of royal succession. But there is no way the Albany heirs could reasonably claim not to have been aware of the need. I would very much like to see the title revived, if not this time then the next (though that will be a minimum couple of decades away). It would always be possible to approach the existing possible heirs first and obtain their confirmation that they have no intention of ever claiming. Another possibility would be an English dukedom with Earl of Albany as a secondary title, keeping the designation alive in some form. It would not be unprecedented to do this, for example the former Edward VIII was created Duke of Windsor when both an Earl of Windsor and Baron Windsor already existed (titles borne by respectively the Marquess of Bute and Earl of Plymouth). And when Edward VII's elder son Prince Albert Victor was created Duke of Clarence there was already an Earl of Clarence. Who, funnily enough, was the then Duke of Albany. None of the above applies to Cumberland; while it would again be a pity if the title fell into permanent disuse it does not have the same ancientry as Albany, and also each successive heir to the suspended title has been careful to observe the Royal Marriages Act requirement. It still does seem unlikely that any claim will ever be made, but if one were then there would be no possible grounds for refusing to restore the honour. So that one probably is best left alone for now. Could it be time for a brand new designation to be borne by The Prince and Princess, if we are coming up against the Titles Deprivation Act with historic ones? Been there, done that with the ludicrous Wessex title. Still, if that unfortunate precedent were followed then Bernicia, Deira and Mercia are all 'available', I suppose. As well as non-existent. The historic Scottish regions are I think all pretty well taken up by extant titles, Ross being one attractive exception to that. Ulster of course is also taken already, being the secondary title of the Duke of Gloucester. I guess one of the old Welsh principalities might be a possibility, though. Duke of Deheubarth, anybody? But I would rather have a historic title than one that smacks of artifice, even if derived from remoter history.